Last night, Roy Halladay left his start against the Atlanta Braves with a mind-boggling stat line. He exited with one out in the fourth inning after surrendering five earned runs, three walks, two home runs, and striking out nine. Nine! According to Baseball Reference, no pitcher has ever struck out that many batters while recording just ten outs or less. The weirdness doesn't end there, though. According to Brooks Baseball's PitchFX data, Half of the pitches that Halladay threw were off speed (27 curveballs, 20 splitters), and he completely abandoned his fastball as the game went on. As Philly.com points out, he threw 21 fastballs in the first inning, and only 26 in the subsequent two-and-a-third. 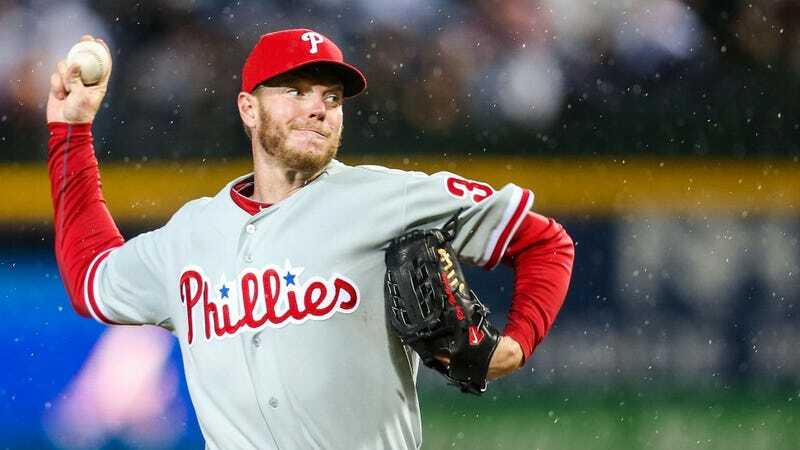 This odd start foreshadows what will likely be an odd season for Halladay. He's two years removed from his last great season, and at age 35, he finds himself at that awkward phase in which he must compensate for his diminished velocity by adopting more of a junkballer's mentality. Those nine strikeouts speak well of Halladay's chances at evolving, but that high pitch count sure as hell doesn't. It could be worse for Halladay, though. He could be Tim Lincecum.